Here’s the points chart for the recently concluded Formula One season, total points plotted against Grands Prix. If you’ll ignore the uncanny performance of a certain blond German kid, it was a pretty close fight…for second place. The chart tells many stories. One is the inevitability of a championship if you add modern reliability to the pairing of a great driver and a great car. There were 19 races this year: Sebastian Vettel, Mark Webber and Fernando Alonso retired from one each, Jenson Button retired twice, and the constant minor accidents between Lewis Hamilton and Felipe Massa were only good enough for three retirements each for the pair of them. Contrast this with, say, Mario Andretti in the Lotus 79 in 1978, another great combination of car and driver resulting in a dominant championship year: four retirements out of sixteen races. Or Michael Schumacher in the Benetton B195 in 1995: four out of seventeen. What this means for the course of a season is, unfortunately, a high probability for no real title fight. If one driver can launch his campaign like Vettel launched his this year, and show in the first few flyaway races that his car is both fast and reliable, he will not lose. Vettel’s championship was basically a given after the Turkish Grand Prix, with 15 races left on the calendar. 2010 in this respect was an incredibly lucky fluke of a season (click on chart to see full size), where three teams produced cars whose imperfections balanced out each other, and they were driven by the current, incredibly strong field of top runners. The only difference this year was that the Red Bull was slightly better and it stopped breaking down. That was all Vettel needed. 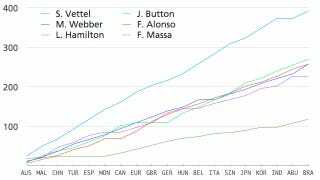 The 2011 chart also shows Jenson Button’s resurgence after finishing fifth last year. He is the year’s biggest winner after Vettel, leapfrogging Webber, Alonso and—for the first time this has happened to Lewis Hamilton—his teammate to finish second. His is the acid green line on the chart on top, and you can see how, except for a pair of back-to-back mechanical failures in Britain and Germany, he drove not only a consistent but an outstanding season, leading the rest of the field from Singapore on. Then there’s poor Felipe Massa, even more out of his depth in the top six than last year. After almost winning the championship in 2008 and in contention for a win at the 2010 German Grand Prix, he never even made it to the podium in 2011. On the other side of the Ferrari garage, Fernando Alonso drove the same car to a great win and nine other podiums for a terrifying points difference of 257 versus Massa’s 118. As for Alonso’s 257 points, which was good for only fourth in the championship behind Mark Webber’s 258, it would have won him his third drivers’ title last year: Sebastian Vettel won in 2010 with 256 points, which would have landed him in fifth place this year. It was mostly his outstanding performance and Massa’s slump that ate up these points.